Earlier this Monday, a new much anticipated blogging platform, Ghost, announced it’s public availability. Ghost is another Kickstarter success story, it was crowd funded earlier this year and here we are it’s first general availability. 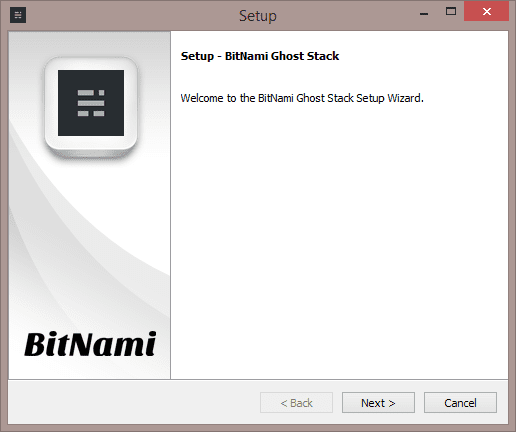 Thanks to BitNami, there is a simple one-click-installer build for Ghost. 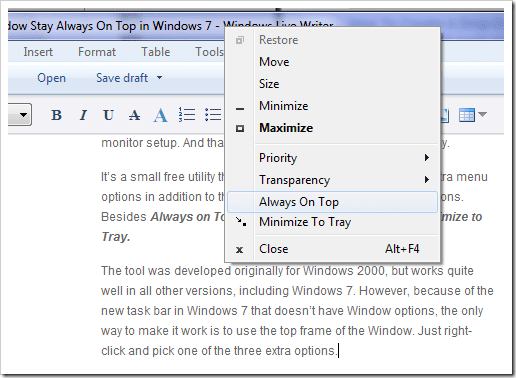 Simply go here and download the Windows installer and following the on screen instructions. 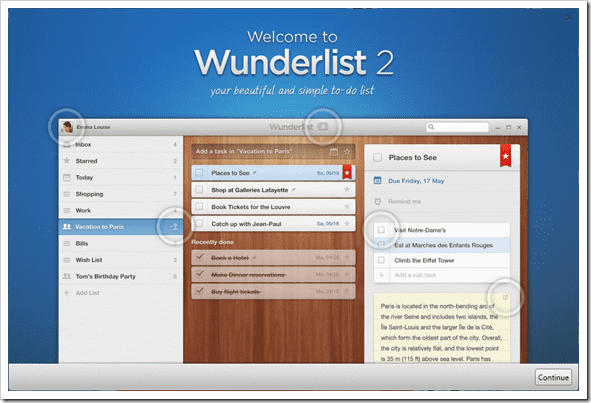 Start the setup wizard once you have download the installer. Choose where you’d like to install Ghost at. Create an admin account, you can enter your name, and email address. 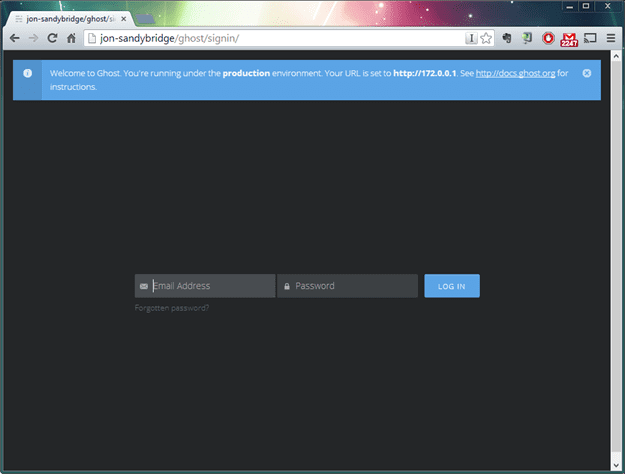 Those will be the login info later on to login into Ghost’s admin dashboard. In this case, since we are only installing Ghost locally, it will be 127.0.0.1. You can configure the email settings, SMTP. If you have a Gmail account, you can use Gmail to send email on behalf of Ghost. Enter your Gmail address, follow with the password. Note: if you have 2-step verification turned on, it will be one of those verification generated password, not your actual account password. 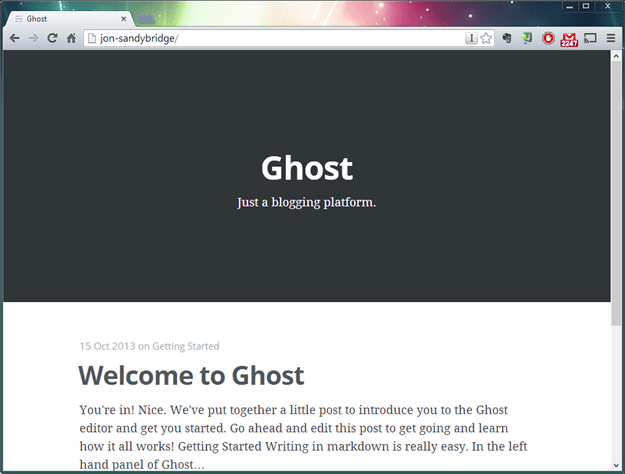 Ghost is a blogging platform, an engine, it will require some web server to run on. 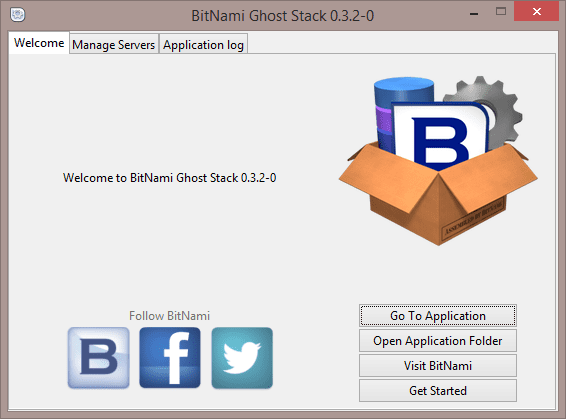 The BitNami’s installer comes with Apache as the web server. If you have any existing Apache running you can configure this Apache to run on different port so it doesn’t conflict with other services. Once you have finished installing, you will see a control panel where you can manage the servers as well as monitoring the logs from the server. Head to your localhost or the hostname of your machine check out the newest Ghost installation. Head to /ghost to login. Here the email address and password will be the one that you have created earlier. 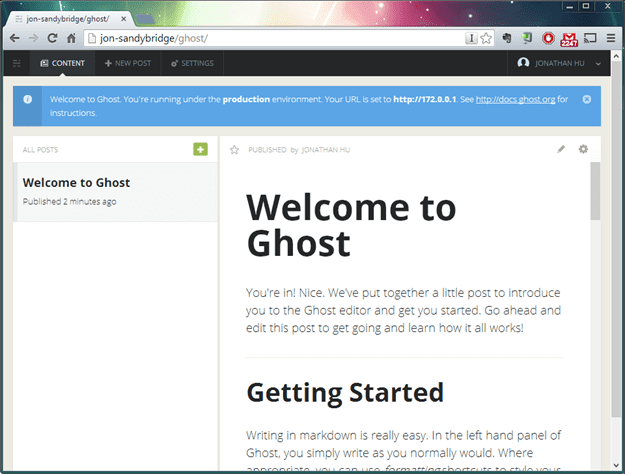 Ghost Dashboard will be present once you have logged in. 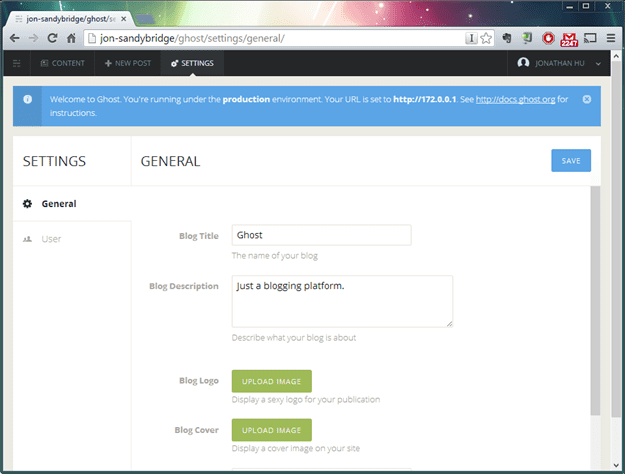 From here you can add a new blog post, update themes etc. 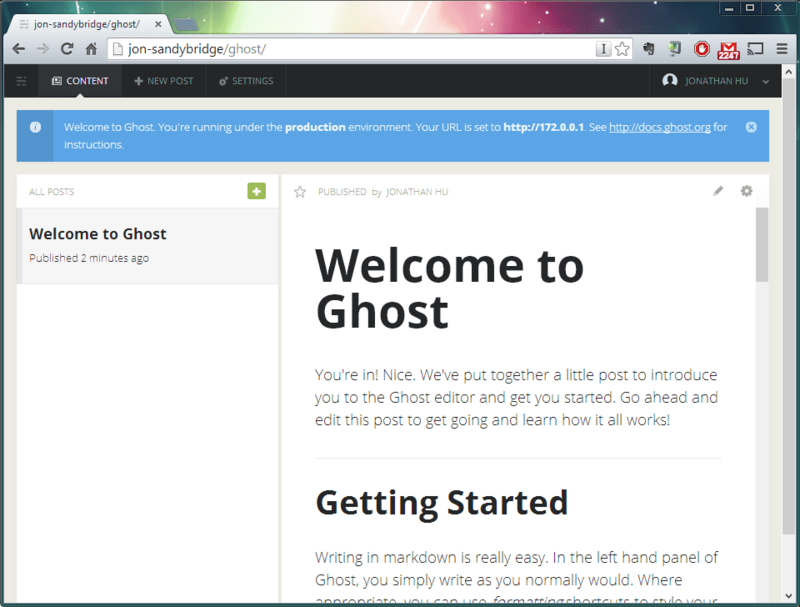 If you’d like to give Ghost a new look, head to the market place to browser for more themes that’s build for Ghost. 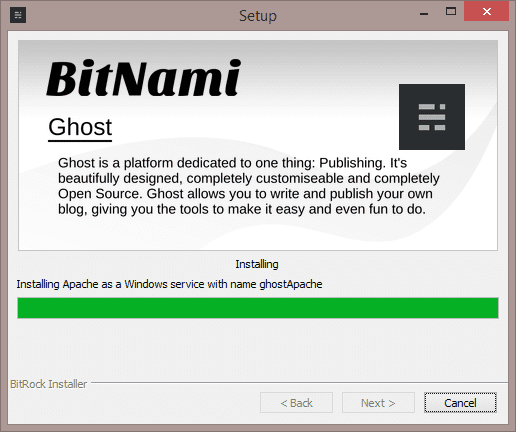 This is it, you have successfully installed Ghost on your local machine enjoy blogging ! 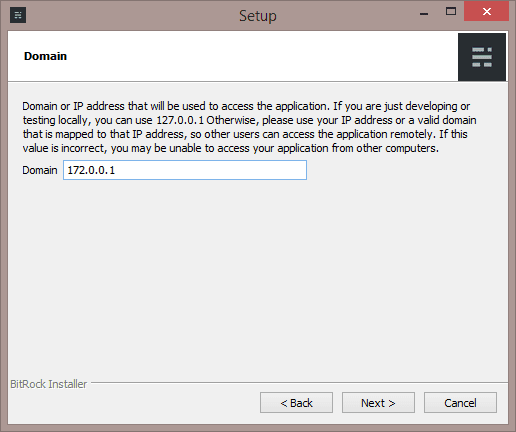 I set the IP as the public IP address for my windows server. 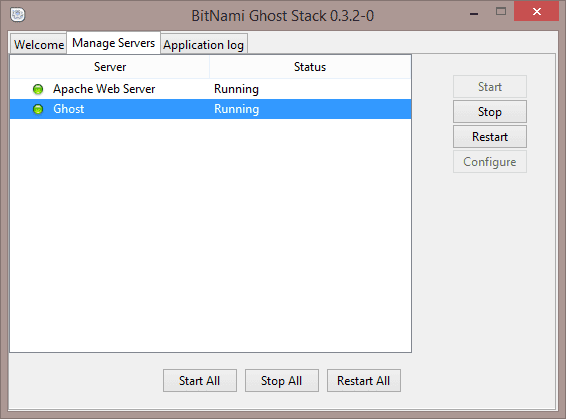 How do I access my ghost instance through the browser on another machine?